... and sewage -- a strong political will is needed to get rid of them? There are numerous ways to get to the lake colony. But there is no way to avoid getting the weeds entangled with the oars. The weeds are something the people have learnt to live with, and have also found a couple of uses for them, such as fertilisers. They complain of ministers and authorities visiting the lake with cleanup plans, which were never followed up. Today, the government has employed a few people to remove the weeds manually, but it has not helped in solving the problem "because they do not remove the weeds from the root. Only those on the surface are cleared," says Nazir Kana. To know what the weed problem actually is, take another route to the lake colony. From the Badami houseboat (opposite the Boulevard), take a right turn. Then the first left. Go straight ahead into the waterway. Filth and more filth confronts you. As you move along the canal, the Dal is but a cesspool of weeds and sewage-ridden stagnant water. Houses on the isles are dilapidated and damp and vegetable gardens bear an unattended look. This part of the Dal is unusually quiet even at noon. The first landmark is a bridge which connects a road across the Dal. According to Nazir Kana, this bridge was blown up during the height of militant activity in the state. Down the road, there is a papier mache shop, which looks like it has been forsaken by its clients. Ghulam Ahmed is one of the five owners of the shop which was established in 1976. "Sales have plummeted because the army does not allow tourists to enter the interiors of the lake. We have to post agents in the Boulevard to get in some tourists," he says. And why would tourists wish to take a ride on the filthy waters to reach his shop? Has any attempt been made to clean the muck? "The area has always been like this. Ministers were approached but no one has done anything," he says. Residents of the lake liken the weed problem to militancy. Says Nazir Kana, "A strong political will is required to get rid of both." One can't help but wonder that if only the water was devoid of weeds and muck, even the lanes and bylanes of the lake would have earned substantial revenue for the state as well as the lake people. Past the papier mache shop is the Abi Nau Pora fishing colony. At 53, Mohammed Jamal is one of the seniors of the colony inhabited by 20-odd families. Jamal blames the lack of rains this season for the stagnant waters. And the filth, he says, is because of the hotels that have sprung up inside and on the lake shores. "They throw all their sewage into the water," he says. 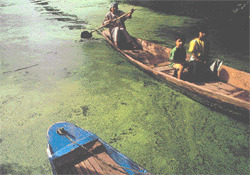 It is not just Jamal who believes that the lake people are not responsible for the squalor. Most of the lake residents spoken to blamed hotels and houseboats owners (considered the affluent among people living on the lakes). Also, city sewage finds its way into the lake. As for people living inside the lake, a garbage collector collects their domestic waste everyday. The sewage, meanwhile, is emptied directly into the water or in agricultural lands where it is used as manure in due course, says Nazir Ahmed. Mohammed Jamal's fish catch ranges between 4-10 kg per day. He says his fish catch has decreased over the years, "because there are more fisherfolk now than it was a decade or so ago, not due to pollution of the lake." But, be it population pressure or pollution, the Dal is slowly dying. Gone are the days of moonlit evenings with the Dal nestling in the lap of the mountains. Politicians and bureaucrats seem to have woken up to the gradual destruction of the lake but their efforts are way below what is needed. They are yet to understand the enormity of the problem. The people, meanwhile, believe the Dal cannot be restored. "A lot of money for the cleanup has come over the years, but hardly anything has been spent to clean the lake," says Ghulam Ahmed. "People have made mistakes but the government should have acted at that time," says Nazir Kana. "Why are they calling it encroachments when they have provided the encroachers with electricty, phone lines, ration shops and other basic amenities?" he adds. The Dal is indeed "bezubaan" (mute). Tourism brochures continue to display all that can bring in tourists and the people living on the lake continue to live off it. Nazir Kana doesn't shy away from saying what he is doing to the lake: "The Dal is speechless, it can't speak. I can do what suits me." That is exactly what he and the fellow "lakers" are doing".